Across Europe, these cetaceans are declining rapidly. In the Mediterranean and the North Sea, they have vanished. Elsewhere, there are now only eight killer whales in the NW Scotland-Ireland population, and only 36 left in the Strait of Gibraltar population. Scientists believe they are doomed to extinction due to harmful chemicals manufactured by man. This worrying decline explains why tourists and marine biologists are flocking to the fjords around Kvaloeya - which aptly translates as Whale Island. Kvaloeya is nestled in the Arctic Circle, close to the city of Tromsoe. It is the land of the Northern Lights, of snow-capped mountains and weak winter sun. It is also the land of observing something spectacular. It's here that a humpback whale announces its presence with a thunderous blast of water through its blowhole - a sound like the opening of the woodwind section of an orchestra. Shortly afterwards, a pod of killer whales arrives on the scene. The orcas glide with grace through the icy water.Marcus Ahlund is a tour guide who spends several hours at sea on his boat every day and often in freezing temperatures. Hearteningly, he is still so visibly excited by seeing the pod. Marcus lives on Kvaloeya and tells me with a huge smile on his face that the numbers of killer whales here are actually on the rise. But he knows the cherished photographs of his passengers and these lasting memories shouldn't be taken for granted. "We thought we lost them," he said. "The island is named after the whales because they were always found here. But for 70 years, the whales abandoned the island. It's only in the last five years that they've been coming back." The return of the killer whales after so many years left locals and scientists scratching their heads. It didn't make sense when the rest of Europe's killer whale population was dying off. Fredrik Broms, a local marine biologist and keen photographer, believes the answer is simple. Food. The killer whales are just following their lunch like a human at a drive-through restaurant - the enormous shoals of herring. "This is one of nature's largest feeding frenzies. The herring changed their route. They have started to come back here and so the whales follow," he said.Scientists believe these Norwegian orcas are faring much better than their cousins in the south because of their diet.In Kvaloeya and across northern Norway, the whales gorge themselves almost entirely on herring. These smaller fish feed on plankton and are therefore less exposed to a toxic group of chemicals known as PCBs (polychlorinated biphenyls). However, in the Mediterranean and around UK shores, killer whales eat large fish that are already higher up the food chain and therefore carry a larger load of PCBs.These harmful chemicals were once used in electrical gear, paints and flame retardants. They were used heavily in the construction of tower blocks but were banned from the 1970s because of their toxic effect in humans and animals.However, the manmade chemicals have leached into the sea, and are accumulating in top predators. Are PCBs from tower blocks killing whales? "A lot of these PCBs, we don't know how much, have not been disposed of and are slowly leaking into rivers and estuaries, from landfills, and eventually into the marine environment," explained Dr Paul Jepson, a specialist wildlife veterinarian from the Zoological Society of London, UK.The chemicals then gradually work their way up the food chain and into the top marine predators, where they accumulate in the cetaceans' blubber.Once a whale accumulates a high enough level of these toxic chemicals, their chance of reproducing becomes non-existent. Essentially, PCBs make the orcas infertile. Researchers analysed samples taken from more than 1,000 killer whales and dolphins in Europe's waters. "Our findings show that, despite the ban and initial decline in environmental contamination, PCBs still persist at dangerously high levels in European cetaceans," explained Dr Jepson.The levels are higher than those found in cetaceans in the waters around America and elsewhere. Now, Paul Jepson has teamed up with the UK Cetacean Strandings Investigation Programme and DEFRA's chief scientific advisor, Prof Ian Boyd, to urge tougher action. "We call on the UK and other European governments to make an inventory of PCBs in joint sealants used in large buildings built in the 1950s-1980s," said the ZSL researcher. "Regulations could also be applied to demolition of these buildings to make sure that PCBs are captured and disposed of correctly - following the lead of some Scandinavian countries." 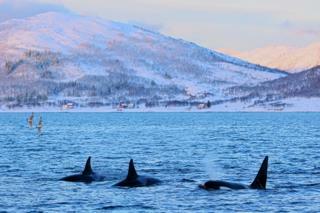 Back to Kvaloeya and the seemingly healthy looking pod of killer whales continues to dance in the water. Occasionally, their dorsal fins break the tide, resembling a pack of submarines. But with more PCBs ending up in Arctic waters, could their time be running out? "PCBs in the Arctic were declining over many years - but in the last 5-10 years levels of PCBs have either stabilised or even increased in some Arctic species like polar bears and killer whales. This is a very worrying trend if it were to continue," said Dr Jepson.As the tour boat begins to make its way back to shore, Fredrik Broms tries frantically captures as many images of the orcas as he can. "It's so easy to tell if a whale has been damaged on the outside, such as colliding with a boat propeller or a fishing net. It'll have scars. But it's much harder to know what's going on inside their body… what chemicals are there."